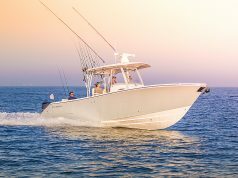 Built at the Glasstream yard in Panama City, Florida, the 280 ZS is a combination angling and pleasure center console that offers high-end performance with fishing amenities. The boat’s stepped-bottom hull offers more deadrise at the transom and runs more than 70 mph when equipped with twin Suzuki DF300AP 300-horsepower engines. 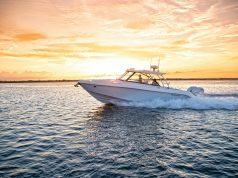 Power options range from the big Suzuki engines down to smaller 150-hp outboards, which still offer good performance and provide the safety of twin engines. 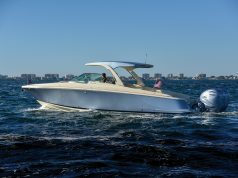 Measuring 27-feet, 8-inch long, the Glasstream 280 ZS on display at the 2014 Miami International Boat Show was rigged with Suzuki Precision Maneuvering that allows the driver to dock with ease thanks to joystick control.